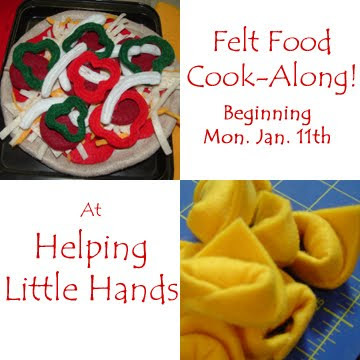 Pieces by Polly: Felt Food Cook-Along! I've been working on Firecracker's birthday present for the last couple weeks and the felt food bug has definitely bit me! If you've been thinking about making some, YOU SHOULD! It's so easy. Plus by making felt food you can customize it to healthy stuff they eat rather than the junk food in store bought sets. So here's what I'm going to do. We're going to have a COOK-ALONG. I'll put up one tutorial a day (except Sunday) for making felt food. We're going to do this in baby steps...just one a day. If you decide to make some of your own and blog about it, just let me know and I'll link up. If you don't blog, then you can just email with a pic to share or leave a comment. This will go on as long as I've got felt food ideas to share. I'll have a button you can take up soon to spread the word. And More! I'm going to be working on lots more items too, hopefully including blueberry muffins/cupcakes, bread, lettuce, pancakes with trimmings, cookies and more! HOW GREAT! I HAVE BEEN WORKING ON FELT FOOD FOR SEVERAL MONTHS AND LOVE IT. SO GLAD THAT I JUST CAME ACROSS YOUR BLOG TODAY. I DO NOT HAVE A WEBSITE TO LINK TO YOURS BUT CAN'T WAIT FOR EACH DAY TO SEE WHAT WE WILL BE MAKING. THANKS ALOT!